I’d rather use my purchased-at-the-supermarket lemons for much better things, and this cake is one of them. Just make sure you eat the cake the day it’s made, while the lemon slices are still soft – I tried slicing the cake again a day after baking it and had to remove the lemon from its top; the cake tastes great without the candied lemon slices, too, but very similar to Nigella’s damp lemon and almond cake. Preheat the oven to 180ºC/350ºF; butter a 25cm (10in) round cake pan*, line the bottom with baking paper and butter the paper. Place the flour, icing sugar, almond meal and lemon zest in a large bowl and mix well to combine. Add the egg whites and butter and mix well until smooth. Pour into the prepared pan and bake for 25-30 minutes or until cooked when tested with a skewer. Allow to cool in the pan for 10 minutes then turn out onto a serving plate. To make the candied lemon slices, place the sugar and water in a large saucepan over medium heat and stir to dissolve the sugar. Add the lemon slices and bring to the boil. Cook for 12-15 minutes or until the syrup has thickened and lemon slices are translucent. 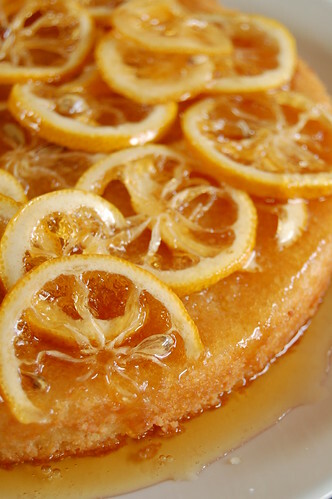 Pour the syrup over the cake and top with the lemon slices. Allow to cool and serve. I gasped when I saw this cake - it is absolutely gorgeous and looks so delicious! I'll have to bookmark it for when Meyer lemons come into season! It looks so good Patricia. I tried something similar with candied oranges over Christmas break. This might be even better! just beautiful! i'm dying to give it a try. thank you! This cake looks incredible- love all the lemon slices on it. I've never seen Take Home Chef, but Curtis Stone is Australian and he regularly pops up on TV shows here. He's going to be on Masterchef tomorrow night. I've never tried any of his recipes. They are not really my type of food. But this lemon cake definitely is. 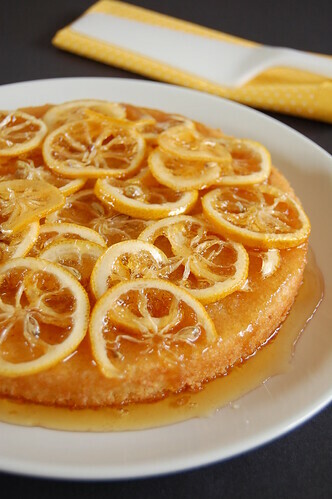 I love lemon syrup cakes. So moist and zesty and just yum! Oh and by the way, thank you for telling your friend Verena about my blog. She left a lovely message for me. Wow! Love how the lemons keep their shape. I've got some in the fridge right now might be time to try something new! Just looking at the gorgeous photo makes my lips pucker! I love lemon cakes. They always taste so fresh, at any time of year. Love your blog! I'm so happy to find it.. No seriously SOOOO happy ! Your pictures turn out even prettier than the ones in the magazine! GoodNESS that is gorgeous! It looks so inviting, but I'd hate to cut it! So moist, sweet and lemony good! I love everything lemon and your cake looks very nice with all the lemon slices !! Yummy ! This looks so vibrant and sunny! I love seeing your posts of the goodies from DH mag :) More inspiration (and kick in the tush) for me to follow suit! That is one beautiful looking cake. Those lemons on top are so gorgeous. Anna, I'm glad you like it, thank you! Aran, thank you! 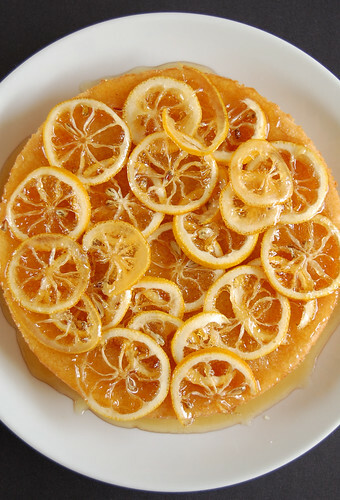 I once made a cake similar to this one with oranges, too, also a DH recipe, but the orange slices got baked with the cake. It was wonderful! Kiss my spatula, thank you! Hope you give it a go! Karine, thank you for stopping by! Julia, that sauce is very sticky and adds a moist touch to the cake. Thank you, darling! I'm glad to know Verena stopped by - your blog is so wonderful, darling! Tender Branson, I hope you like it! Lydia, very fresh - they have a summer feel, don't they? Room design studio, thank you! I'm glad you like it! Pam, you are much too kind, my dear - thank you! Maybe, I'm in for anything lemon, so I was all for making this cake! Joey, I knew you'd love this one, dear! Pea, thank you, my friend. Fiolunka, tks for stopping by! Wow what a gorgeous gorgeous cake! I love how the lemon slices look on top - so unique. I can't believe someone would grind up lemons and waste them just to make the kitchen smell nice!! Great recipe!! Great photos!!! I´m sure the taste is fantastic!! Nice recipe.This one looking so beautiful..
loving the look of this - great photos too. That is just gorgeous! Not too long ago I made candied lemons for the first time so this is a must-try!